If you have a trampoline in an area that is prone to strong winds or major storms, you know the importance of tying things down before bad weather hits. One item that is outdoors and people usually do not consider tying down is their trampoline. That is, until it is too late and their trampoline is lifted off the ground. That is why there are trampoline anchors and tie down stakes available for you to use because no one wants to see a large steel disk flying around their yard. 1 Is It Necessary to Tie Down Your Trampoline? 2 Which Is Best? Trampoline Anchors or Tie Down Stakes? Is It Necessary to Tie Down Your Trampoline? Trampolines are, in essence, large disk shaped objects that are lifted off the ground by about 3ft. This means that wind is free to travel above and below the trampoline mat. Often, this is not a big problem, but when the wind speed increases, the risk of accidents can occur. Every year there are people who experience what it is like to have their trampoline take flight and damage their home, their fence, and even things in their neighbor’s yard. There have been reports of a trampoline flying up into the air and landing 150ft from where it was located and people have watched their trampoline flip with as little as a 40mph gust of wind. The only way to prevent possible damage to your trampoline, home, neighbor’s home, etc. is to either take apart the safety net and trampoline mat or tie it down. By disassembling it, you are not creating an air pocket. The downside is, disassembly is not always possible in cases of a sudden storm approaching. Therefore, ensuring that it is always properly anchored is best because whether you are at home or away on vacation, you can feel reasonably certain that your trampoline is not going to pose a danger to anyone or anything. You can learn more about why you might need a trampoline anchor by reading our ultimate trampoline winter care guide. Which Is Best? Trampoline Anchors or Tie Down Stakes? 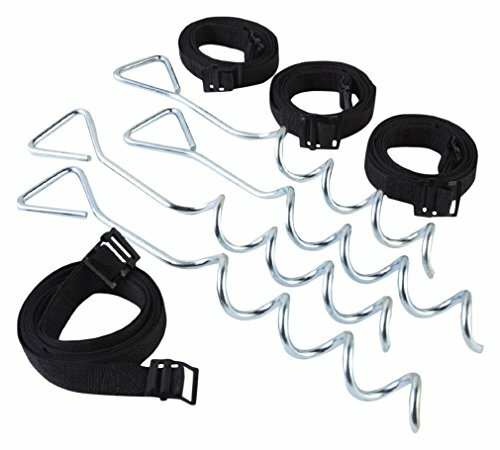 When looking at trampoline tie downs, there is no true guide for which is best. If the wind gets high enough, there remains a possibility that even the best anchors and stakes will fail. 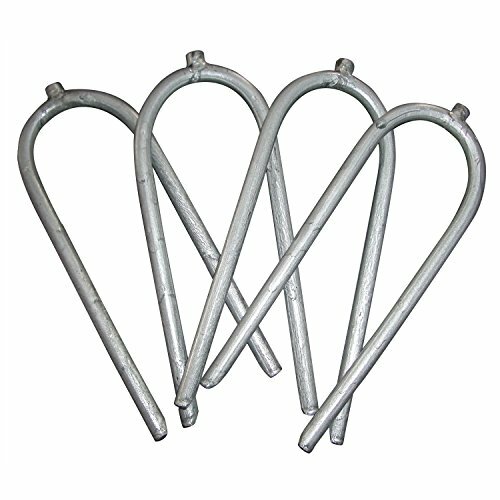 However, you decrease the chance of problems by either purchasing anchors that twist down into the soil several inches or by digging a hole and pouring cement into it before placing the trampoline stakes into the ground. You have options when it comes to figuring out how to tie down a trampoline. You can either decide on a permanent place for your trampoline and then dig a hole for the stakes, pour in the cement, and hope that you never find a reason to move it, or you can choose a less permanent solution. .Regardless of which type you choose, the important thing is that you make an informed decision on how to secure your trampoline. 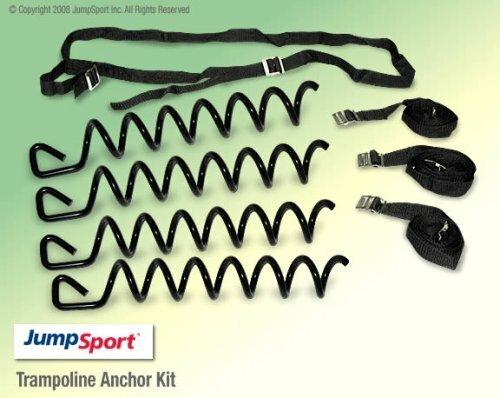 To help you decide which type you feel will protect your family and everyone around you, here are a few of the most popular trampoline anchors. 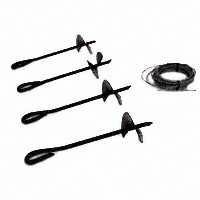 If you are certain you want to put your trampoline in one place and leave it secured there permanently, this set of 4 stakes will allow you to do it. They are designed to work with any trampoline that has 2” steel tubes for the legs. To learn more about how other people feel they work for them, you can read a full review in our trampoline accessories section post. 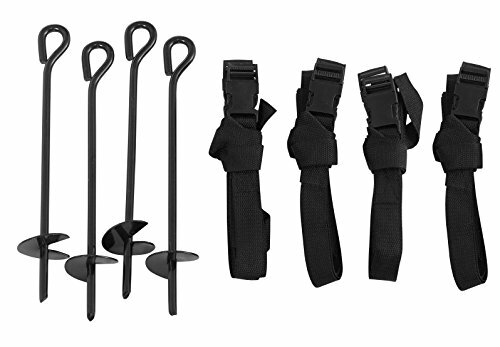 This single kit includes everything you need to secure your trampoline, including the straps and augers to tie down each of your trampoline legs. All that it takes is a little bit of your time and you will immediately increase the safety of your trampoline. If you would like to know whether it is a stable fix or not, you can read the full review, which includes parent’s thoughts, in the trampoline accessory section of our website.